July 30, 2007. Mei-Mei, was one of the early Dolphins built by O'Day. There was, and still is, some confusion about who built some of these these early boats. While initially your webmaster thought this was a Lunn built boat, it does seem to be a Marscot/O'Day boat. Its not clear who was the first owner of this boat. We are working on this. A few months after this website went 'live' it caught the attention of Gib Sosman and his sister who used to sail of their father's Dolphin. We are trying to get a picture of Mei-Mei as she was back in the early 1960's. We do have a picture of her from the 70's as Roland McGuire's Redheds and we will use it here until we get one of Mei-Mei. Gib sent in the following emails - edited by your webmaster. Just discovered the website. Delightful. Really interesting. My dad bought (an all-fiberglass) Dolphin in Marion, MA in about 1960, or '61 or '62. It had an inboard 5- (or was it 8?) hp Palmer. He named it "Mei Mei" and for several years we sailed it out of Pine Island Bay in Groton, CT, from Shennecossett Yacht Club. We sailed in a number of races (with the Off Soundings Club, I think) around Fisher's Island Sound and Block Island Sound, and also cruised in stages from Groton all the way to Annapolis in stages. I was about 12 years old and got to go on these races and modest voyages. Very special. It was a great boat. I saw something about Stan Secura on one of your pages in the History section. I'm sure we were in some of the same races with Stan back in the early sixties. If anyone ever heard about "Mei Mei" or my dad, George Sosman, or knows what ever happened to her, or what hull number she had please let me know. From what I was reading on your site, I suspect that the hull was one of the ones from #2 to #9, but am not sure. Thanks so much for your reply. Your info about it being hull #20 and made by Lunn is most likely correct. Webmaster Note: Current thinking/speculation has determined this boat was a Marscot/O'Day built boat) I'm sure we got it in Marion, MA and if not new, it would have been almost new. My brother or sister probably can remember the year and season we purchased Mei Mei, but all I know is that it was either 1960 or in the early '60's. "... I called the Director, introduced myself and gave him the reason for my call. He stopped me in mid sentence and said “before you go any further, I am a former Dolphin owner myself and I know that, sooner or later someone will come by who knows what a Dolphin is, and will recognize what a good value this boat is for $2000. We are not going to take a penny less”. So, I bit my lip and said I’ll take her. " I love that story. As a kid, I didn't realize what a fine design and fine-performing sailboat the Dolphin was. I'd never heard of Olin Stephens or Drake Sparkman and of course didn't know that the Dolphin was one in a pedigreed line of designs by perhaps the best American yacht designers of the era. After almost a half-century, many are still sailing; that's a testamen in itself, which says a lot for their original beauty of design, their good performance, and, well, character, that the Dolphin design has. I much appreciate your letter about this. My sis found your website and sent me the address, so yesterday I just went wild reading about Dolphins and trying to remember my own experiences with ours, etc. I just looked at the Darwin photo. It might be the same boat; impossible to tell from the photo... if so, the old Palmer inboard was probably removed, since the Darwin photo shows an outboard motor on the transom. February 18, 2010. Mei-Mei was sold to Andy Anderson around 1965. He named her Tigress. 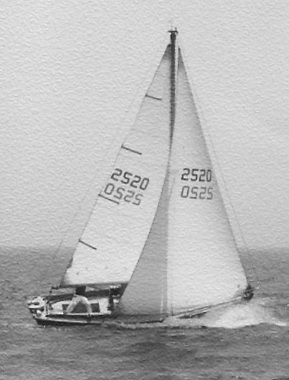 This boat, O'Day hull # 20 had an outstanding race record under several different skippers. To see the list go to Rosters, Hull # 20. We do have a picture of her from about 6-7 years ago as Josh Lyon's Darwin. (Click here to see her). Her inboard was removed and she had a outboard. She is currently looking pretty forlorn, abandoned at the Pine Island Marina in Groton, CT.